Eagerly awaiting fields of spring flowers? 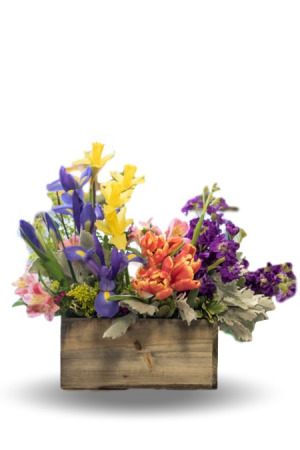 This wooden box will bring you a small field into your home with iris, tulips, daffodils, stock and alstroemeria. Box is 4.5" Tall. Upgraded prices include more flowers and are designed to keep the same look and feel of the arrangement. "Mother's Garden" is designed in a keepsake ceramic container with a floral design on the front. This arrangement is designed with Hydrangea, Cymbidium Orchids, Roses, Snap Dragons and Thistle. 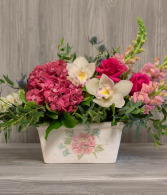 Container is 9" wide and 4.5" tall Upgraded prices include more flowers and are designed to keep the same look and feel of the arrangement. 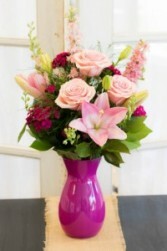 Shades of Pink are on point with this Pinkalicious arrangement from the vase to the variety of flowers. Vase is 8" Tall. Upgraded prices include more flowers and are designed to keep the same look and feel of the arrangement. Spring flowers send love and sweet wishes to your mother this Mother's Day. 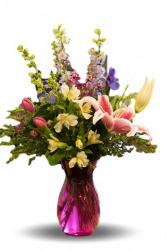 This bouquet brings together a collection of iris, tulips, alstroemeria, larkspur and lilies. Vase is 8" Tall. Upgraded prices include more flowers and are designed to keep the same look and feel of the arrangement.